The Board of the Riigikogu, the Parliament of Estonia, today approved the 15-member composition of the European Union Affairs Committee, where all factions and standing committees are represented. The members of the European Union Affairs Committee are Monika Haukanõmm, Johannes Kert, Maris Lauri, Jaak Madison, Marko Mihkelson, Marianne Mikko, Andrei Novikov, Kalle Palling, Juhan Parts, Rein Ratas, Mihkel Raud, Martin Repinski, Andre Sepp, Aivar Sõerd and Toomas Vitsut. The Chairman and the Deputy Chairman of the European Union Affairs Committee will be elected at the first sitting of the Committee on Friday, 17 April at 11 a.m. 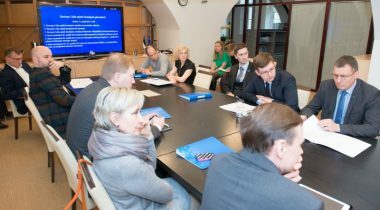 The European Union Affairs Committee has a deciding and coordinating role in the Riigikogu in the issues connected with the European Union. In cooperation with other standing committees of the Riigikogu, the European Union Affairs Committee prepares the opinion of the Riigikogu on draft European Union legislation and gives the mandate to Estonia’s positions for the meetings of the EU Council of Ministers. Pursuant to the Riigikogu Rules of Procedure and Internal Rules Act, the European Union Affairs Committee must have at least 15 members, including at least one member from each faction and standing committee.